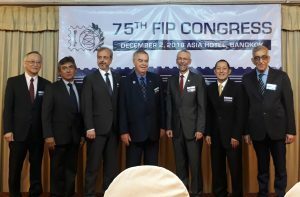 Mr Bernard Beston (Australia) has been elected as the new FIP President, together with new Vice-Presidents for Asia Dr Prakob Chirakiti (Thailand) and new Director for Asia Mr Richard Tan Eng Chuan (Singapore), during the 75th FIP Congress held on December 2, 2018, in conjunction with THAILAND 2018 General World Stamp Exhibition. The new FIP Board now comprises: (above photo f.l) Messrs Richard Tan; Aldo Samamé y Samamé; Reinaldo Macedo; Bernard Beston, Bernard Jimenez; Prakob Chirakiti and Yigal Nathaniel. 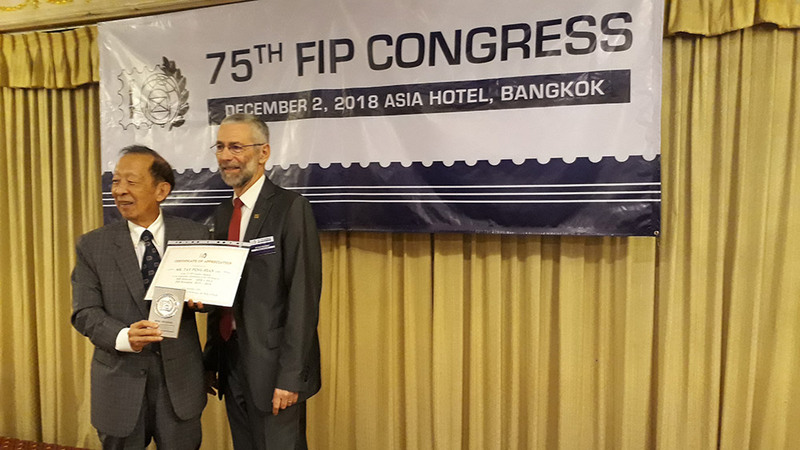 On behalf of the FIP Board, FIP Vice-President for Europe, Mr Bernard Jimenez (above, right) also conferred Mr Tay Peng Hian (above, left) as the Honorary President of FIP for his 16 years of service to FIP, including his 8 years of service as FIP President. He also presented the Medal of Service and Certificate of Appreciation to Mr Tay for his efforts and huge contribution to organized Philately over the last 30 years.